I love a good hand-rolled sushi roll as much as the next person, but I can only imagine that making hundreds of rolls of sushi every hour can be an exhausting and difficult experience for the chefs behind the sushi bar. 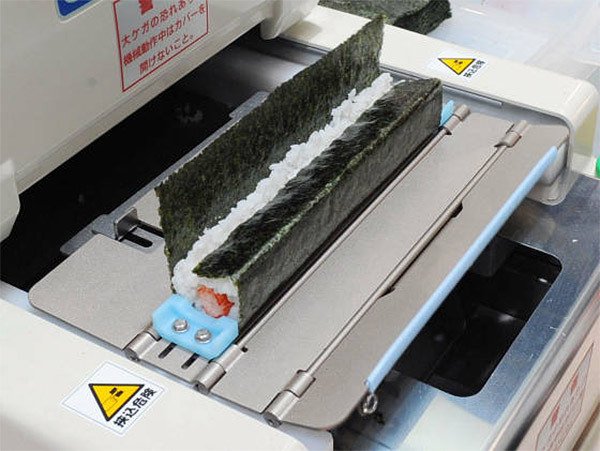 Well, the Japanese have a solution for this – sushi-making robots! The Suzomo SVR line of SushiBots can crank out up to 280 to 400 rolls of norimaki in an hour, taking ingredients and rolling out a perfect square roll. From the looks of things, Suzomo offers quite a range of robotic systems for mass-production of sushi. Would you eat sushi that came from a robot, or do you require that humans prepare all your food?